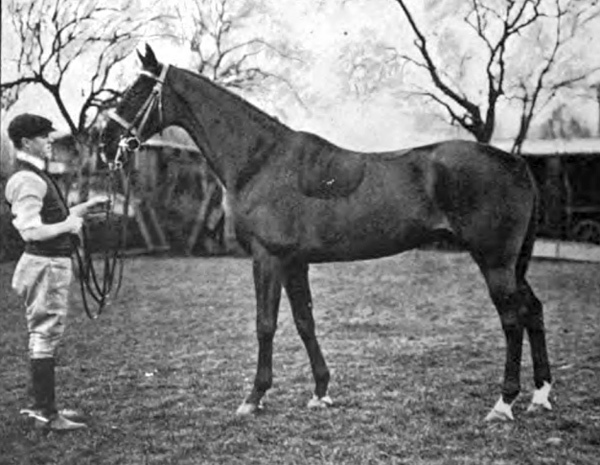 For some time one of my ambitions had been to ride for a good English dealer in the Shires, but amongst all my “horsey” friends I could find no one who knew such a dealer sufficiently for my purpose. The Fates, however, were kind to me. One summer in Worcestershire I met some hunting people; as it happened they knew Mr. Darby of Hillmorton very well, and gave me a letter of introduction. I wrote stating the plain facts, that horses and hunting were the only things I cared about, that I could not afford these luxuries unless someone mounted me, and that I had been schooling young horses for dealers in Ireland. I sent this epistle off without the faintest hope of a favourable answer, so my delight and astonishment can be imagined when I heard by return that Mr. Darby would be pleased to mount me, but that his horses were all trained hunters. I regarded this letter with awe as a kind of ” spook ” that might vanish, or turn into words of polite refusal ; the luck seemed to be too good to be true, especially as my hunting friend, never having seen me ride, very naturally refused to say anything about my qualifications. Still meditating on my good fortune, I went off to play Bridge with some friends staying at the hotel, and as we were talking in the gardens a fussy motor whizzed up, and half in fun I said that I would like to “hold it up” and go over to Rugby. A lady of the party asked me if I really would hold up a strange car, and I laughingly told her that I had done so more than once in Ireland, whereupon she vanished into the house, returning a few minutes afterwards calmly to announce that, liking unconventional people, she had asked the owner of the machine to take me to Rugby ; he said he would be delighted, and they were waiting for me to start. In another five minutes I was whizzing along with three unknown companions towards the goal of my ambitions. The chauffeur was youthful and reckless, he had only just learnt to handle a motor, and wanted to show off her paces, which he did at the rate of forty miles an hour. It was a most exciting drive entirely ; only a special providence kept the car right side up, and ourselves inside it. All went well, however, until we had passed Rugby, when the machine broke down hopelessly, and as I was not far from Hillmorton I walked on, interviewed Mr. Darby, and was shown some of the horses – beautiful types of well-bred, compact weight-carriers, up to 14 stone and over, standing on an average 16.1 h., although one did not realise their height, they were such grand make and shape ; a well-made polo pony turned into a 16 h. hunter best describes the type of the majority. They were a pleasure to look at, and, as I have since discovered, a pleasure to ride, which is not always the case with good-looking animals ; but Mr. Darby will never buy a hunter unless it has perfect mouth and manners, and these qualities added to the type of horse that fills his stables have justly given him the reputation of turning out the best hunters in the Shires. Four months later saw me ensconced in my rooms at Rugby, feeling, I must own, a trifle lonely and ‘Ireland sick’, though my spirits were somewhat revived by the landlady giving me peat to burn, for the smell was joy to my nose. In the interval of three days before my first hunt I made my sitting-room presentable; and having cleared out dozens of horrible ornaments, I found stowed away in an old cupboard some beautiful china – old blue, Sevres, and Wedgwood; also a Chippendale table, and some old silver ; so that my time was pleasantly occupied in cleaning them up. My first hunt was with the Atherstone at Newbold Revel. I had meekly requested to be put ‘up’ on something that would teach me the timber trade, and was mounted on a big brown mare up to any weight. As I ride 9 st. 6 lb. with the saddle, etc., thrown in, I am not quite sure she realised there was anyone in the saddle. The first objects that struck my attention going to the meet were numerous little red boards, which I learnt spelt ” wire.” At the meet the big crowd rather alarmed me ; but thank heaven they do not ride like an Irish field, or there would be none of them left alive to tell the tale. The small regiment of grooms carrying their respective owners’ lunches, some of them top-hat, cockaded infants, looked really too ridiculous in the hunting field. Of course in Ireland we do not have second and third horsemen chivvying us round the country; we are more like Mr.Snaffle. ‘None, sir,’ replied Snaffle, confidently. One also missed the friendly chaff and banter, horse coping, and cheery greeting; even when men in the Shires shoot over their horses’ heads they do it in a polite ceremonious fashion, without “language” apparently. How John Watson would make them sit up ! It is sometimes long odds against getting a good start, especially if the only way out of the field happens to be a narrow gateway. I was of course very keen to see the country and fences, having had extremely vague replies to my questions on the subject. One M.F.H. 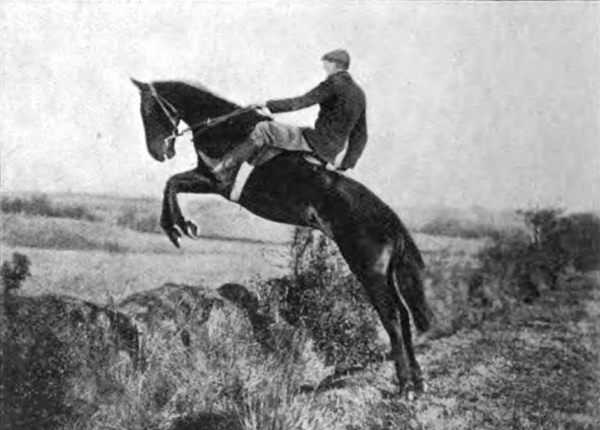 told me that ” any fool could ride in the Shires.” Certainly ignorance is bliss on a good horse, and one often sees people who know nothing about the game going well more by luck than anything else ; but as a rule a few falls soon sober their enthusiasm. I imagine, however, that the Master referred to the lines of gates, although gate-opening seems to be an art in itself; personally I cordially detest gates unless some kind person is holding them open, and one happens to be the first through, in which case you can think ‘Now we’ll all start fair, you tinkers !’ – knowing that it will take at least five minutes for the crowd behind to extricate themselves from a bumping mass. On the occasion of my first hunt we were all jammed into a narrow road, hounds opened in covert at once, and a feeble ” toot ” announced the ” gone away ” (very different from the blood-curdling screams of the Tipps). A regular stampede followed, sounding like the thunder of an avalanche, and one got carried along, feeling as helpless as the pigs possessed of the devil, and by the time one got clear of the crowd, hounds were racing three fields ahead with a scent they could eat. Small thorn hedges, a few with a ditch, were the order of the day, and I made my first acquaintance with ridge and furrow, which is like plunging over a choppy sea ; one also had to steer through innumerable ant-heaps and mole-hills ; and although the country rode wonderfully light, it is harder work riding than it is in Ireland, chiefly, I suppose, because the fields are bigger and the fences are jumped bigger. 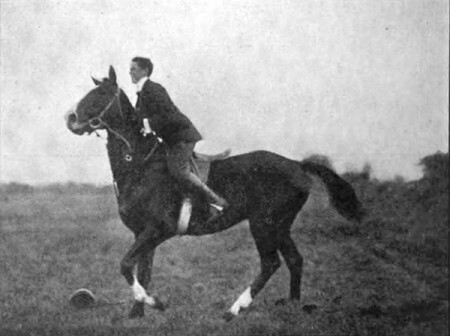 One is galloping all the time; it is not a case of pulling back to a trot or walk to ” negotiate ” them, and of course the hounds with a good scent are much faster. With one short check crossing the railway they ran to ground a seven-mile point in 45 min. A good authority told me that only 10 per cent, of the crowd really ride to hounds ; and, as some wise person remarked, there is always plenty of room in front. If one can escape the numerous railways and canals it is a glorious country to ride over on a good horse; a bad one I should think would be useless, as the fences take some jumping. Not a few of the thorn hedges are very blind and straggly, and one requires a clean, bold fencer who will not only jump big but jump on ; clean timber in the shape of rails, and what I believe are called binders, seem to be the typical fences. 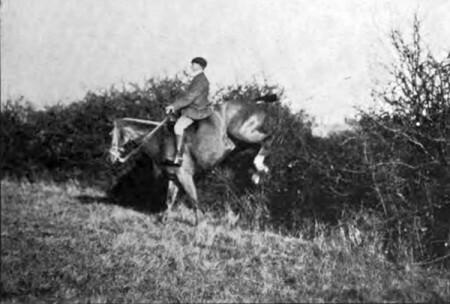 In a fast hunt with the Pytchley from Shawell Wood we had a most pernicious line of timber, and people were falling with crashes at every fence. 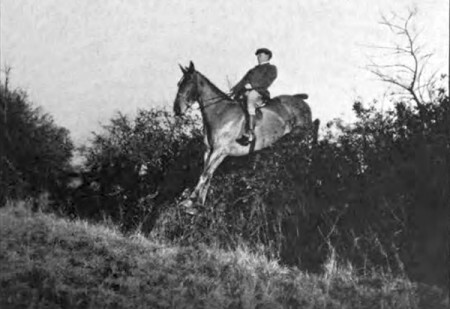 One uninviting obstacle consisted of a wide ditch, a bank riddled with rabbit holes, with a binder hedge on the top, and I was delighted to see the horse in front sit down on the hedge, which took the starch out of it nicely. Two gallant ” craners,” if I may use the expression, galloping at the fence both swerved into the ditch on top of each other. One sees many amusing incidents, and it is extraordinary how some people will follow anyone who is galloping, with no idea of where the hounds are. The other day I had just changed on to a fresh horse; hounds were away on a screaming scent soon afterwards. All went well at first until I let my steed out over a big field, when I discovered there was a difference of opinion between us. 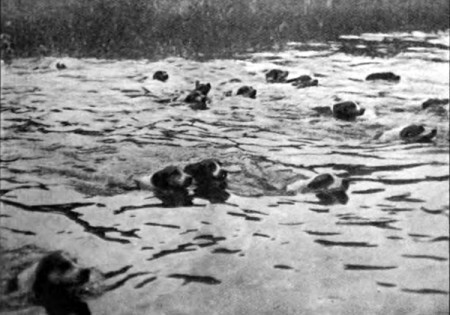 The only jumpable place was blocked by four or five people waiting their turn to get over, and not wishing to be had up for their premature decease, I was obliged to pull off and charge downhill, with my back to hounds. Three or four men, evidently not hearing the language I was talking to my horse, turned and followed ! Having finally pulled up on the top of a hill, I was rewarded with a bird’s-eye view of the hunt. The hounds were hunting beautifully by themselves, and the proverbial sheet might really have covered them. The surrounding fields in all directions were dotted with scarlet and black coated sportsmen, and they must have spread out over several miles of country. The Hillmorton Brook also affords plenty of amusement. It is not wider than a Meath  drain, but the sides are rather soft, and some time after the hounds and most of the field had crossed it, a head and shoulders were visible above the bank. A horse had gone in, refused to jump out the right side and continue, and the effect was very quaint. At the same brook, which we crossed the other day with the North Warwick, a man had an extraordinary escape from a nasty accident. 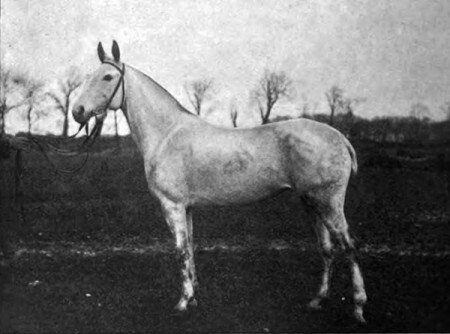 His horse jumped on to a pole that was sticking up in the ground on the landing side ; the pole was five feet long, and it went between the animal’s fore legs, through the martingale, and out through the girths. 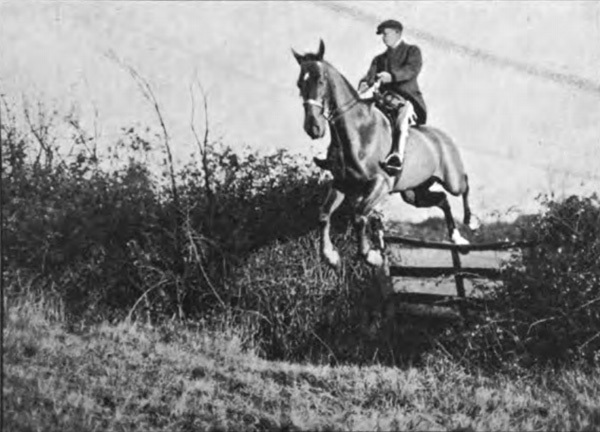 The rider got a fearful shock, because he thought the rest of the pole had staked the horse through ; fortunately both came off scatheless. 1. Bullfinch: High hedge with straggly top which is brushed through. 2. Meath: Meath is a county in Ireland.